The Association’s annual programme covers free, public lectures on the Cathedral, and – for its members – excursions, guided tours and themed travel. The Association’s lecture programme has become, over the years, a valued platform and resource for leading experts on the Cathedral. Whether big-name speakers or rising stars from university departments in France, Germany and Switzerland, many of them use it to give their hearers a preview of ideas and discoveries which have not yet been aired in the specialised journals. Drawn from a broad range of relevant disciplines, they include historians, art historians and archaeologists, as well as theologians, musicologists and others – and their various specialisms were well represented at the scientific colloquy which we organised in March 2015 to mark the Cathedral’s millennium. Our programme is now defined in close collaboration with the Oeuvre Notre-Dame Foundation. 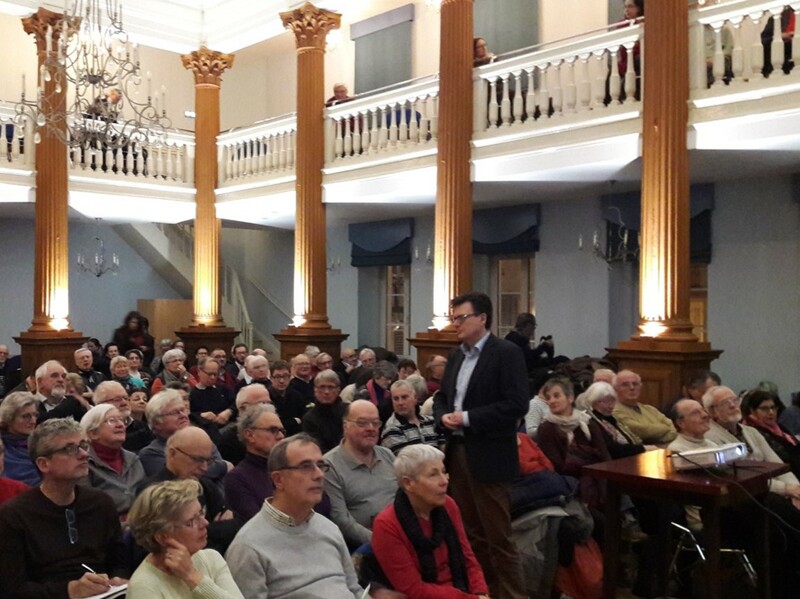 Illustrated talks of 1-1 1/2 hours, question time included, are held every month-or-so from October to June at the Munsterhof, 9 rue des Juifs. A typically attentive audience at one of the Association’s lectures. Members-only tours, led by specialists, are another important part of our programme. 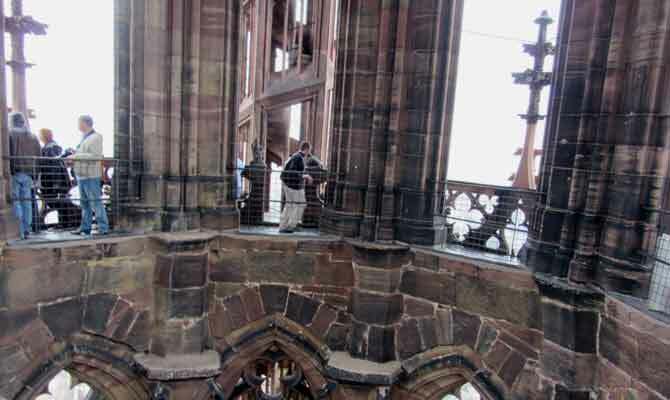 In Strasbourg itself, we organise tours of the Cathedral, the city’s medieval churches, museums, exhibitions, etc. several times a year. Once or twice a year, we have excursions to towns in Alsace or adjacent regions, as well as longer journeys, lasting several days. During the 2017-2018 Season, for our Autumn and Spring excursions we visited, respectively, Metz and Colmar. Our annual tour in May featured visits to Sarrebruck, Aix-la-Chapelle, Triers and Luxembourg. At all these venues we were met by local guides well versed in the history of the sites we visited. In Strasbourg, our programme of visits to the city’s museums and other institutions included : a private viewing of the display of historic documents on the cathedral in the Andre Malraux Library and a guided tour of the exhibition “Neo-Gothic !” in the Strasbourg National University Library. Events focusing on the cathedral included a tour of the upper levels of the building and a private viewing of the Virgin Mary tapestries. Members were also invited to discover, with Jean-Paul Lingelser our honorary President as their guide, the marks left by 150 years of protestantism on the cathedral, and to attend a pre-view -plus excellent talk by Pierre Julliot- of the new edition of the 3-D film on the astronomical clock, now shown to visitors. For information on the 2018-2019 programme, consult our news feed or contact us direct. Visit of the Cathedral’s tower.